Eureka, its time for another tasting. The one we are looking at today is the Festive Pale Ale I did at the beginning of March 2012. This was a straight forward Pale Ale recipe with Pilsner malt and Carapils as a base, some Saaz, Amarillo and Cascade hops and the legendary #1056 American Ale yeast. Started with a gravity of 1.048 (12.2°P) and finished at 1.007 (2°P). ABV around 5.5%. I dry hopped this brew with some Amarillo and Cascade hops and racked it in a keg. Unfortunately, some hops remained in the keg and plugged the outlet of the keg for several times. I learned: Either rack more carefully or use a bag for the hops to prevent a stuck keg. Aroma: Very fruity aroma. Could detect some citrusy and lichi notes. The fruity aroma covers anything else. Really nice! Appearance: Pours with a yellow color, white head, no carbonation visible and some particles float around (mostly hop debris). Flavor: Huge fruity notes much like in the aroma. Some honey, maize and bready-sweetness as well. These notes could be from the Pilsner malt. Mouthfeel: Light to medium body, some carbonation, short and slightly bitter aftertaste. Quite refreshing. A lot of the carbonation gets lost during the pouring from the tap. Due to the plugged keg, it foams a lot and the carbonation gets lost. Overall Impression: Not bad for a Pale Ale. It is quite refreshing although a bit watery and very limited in the flavors. This is a beer you can easily enjoy during a hot Summer day. The beer turned out as expected. : Refreshing, thirst quenching and easy to enjoy. Although not my favorite brew. To be honest, I am not a huge fan of Pale Ales in general. Lately I am focusing on beer styles which are more accessible to the general beer drinkers. I do so to have recipes on hand for upcoming events, tastings and a secret I share with you later on… Stay tuned! Eureka, its time for another recipe. Today’s recipe is a recipe I designed to get rid of some leftover malts and to use the bugs I isolated from commercial sour beers. This recipe is the first base of my very first Solera. The Solera technique in sour brewing is a wonderful way to maintain the souring bugs over a period of time. You basically fill a wooden barrel (in my case a carboy) with fresh wort and dump some dregs/bugs in there as well. After a year or so, you remove part of the liquid and replace it with fresh wort. Then repeat the procedure a year later again. Over time, the beer gets a matured character. I started my first Solera with a pretty basic recipe and intend to add some Stout or Porter next year to get some roasted character. Unfortunately, I do not have the space and capacity to fill a wooden barrel, I therefore used the poor man’s barrel: wooden chips. 04/27/12: Brew day number 52. Crushed all the grains and rested according to the protocol. Iodine test was negative and I therefore proceeded with the sparging. Then boiled the wort for 90 min with the addition of the Hallertauer hops. After cooling the wort down to approximately 20°C (68°F), I added the yeast cake of a previous beer (#50 Folly Red) which consisted of Wyeast’s #3763 Roeselare Blend and #1581 Belgian Stout yeast. Did the primary fermentation in a plastic fermenter. I originally planned to get 20 L (5.3 gal) with a gravity of 12.2°P. Maybe the raw barley was not as efficient as planned. Anyway, I then prepared the souring mixture for the secondary fermentation: Added some Girardin Gueuze dregs, Brettanomyces isolated from the Girardin Gueuze and 3 Fonteinen Geuze and the dregs from the Les Trois Dames Oud Bruin along with 50 g of medium toasted American oak chips in an Erlenmeyer flask and left it at room temperature. Eureka, its time for yet another tasting post. Today, we are looking at the #49 Belgian Oatmeal Stout. 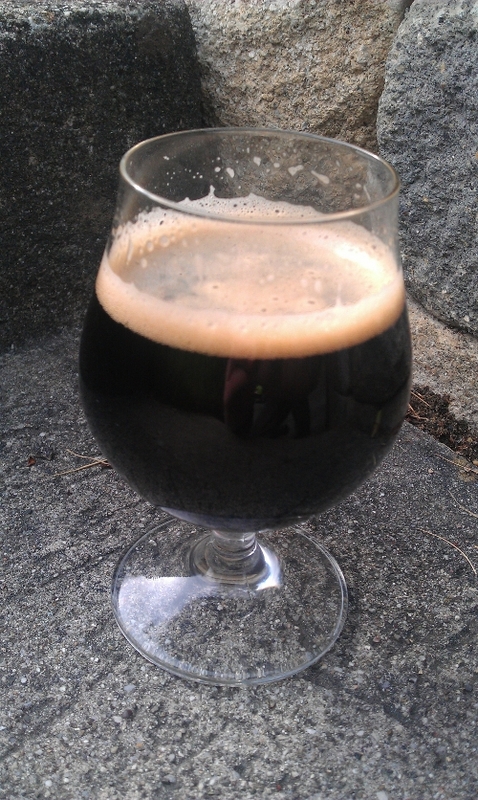 The recipe was a straight forward stout recipe with some oatmeal flakes in the grist and fermented with Wyeast’s private collection strain #1581 Belgian Stout yeast. Original gravity was 1.053 (13.2°P) and finished at 1.016 (4.3°P) with an ABV of approximately 4.9%. 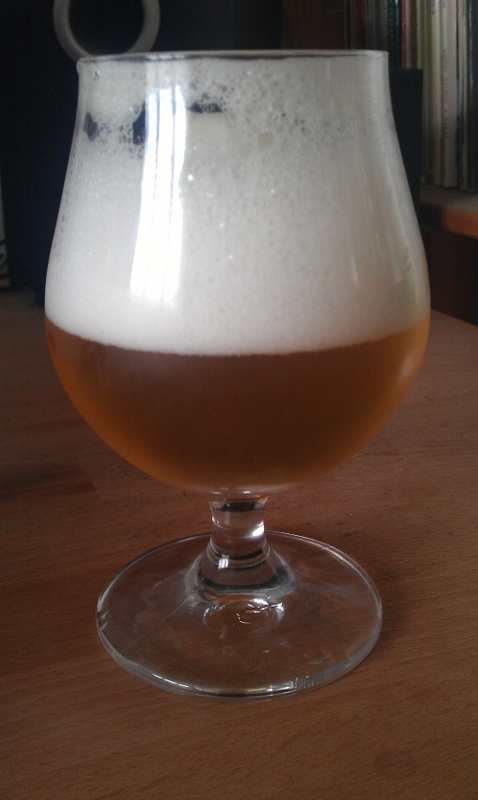 Lets have a look how the beer turned out after 7 weeks of maturation in a keg. Aroma: Metallic roasty aroma with huge coffee and smokey notes. Could detect some bready sweetness (maybe from the oatmeal?). No phenolic or banana aroma notes. Although, there were some aroma which reminded me of raisins. Very nice! Flavor: Lots of coffee and roasty notes. Could detect some metallic notes as well. Rather subtle flavor profile. No typical Belgian yeast characteristics such as phenolic or banana notes. Mouthfeel: Medium body, average carbonation level. Finishes with a slightly bitter and roasty aftertaste. The bitterness could be due to the roasted barley. Overall Impression: A pretty neat brew. Not an aroma and flavor bomb but rather easy to drink and enjoy. I already decided to do another batch and use Wyeast’s #1084 Irish Ale yeast for a comparison. Wyeast describes the #1581 Belgian Stout yeast as following: Very versatile ale strain from Belgium, ferments to dryness and produces moderate levels of esters without significant phenolic or spicy characteristics. This description is spot on in my opinion. I will use this strain for a Russian Imperial Stout soon. Stay tuned for further post to come! Eureka, its time for yet another recipe from the past. Today’s recipe is my very first wheat beer recipe. The original recipe is from a homebrew supplier (SIOS) and is called Weischwieweizen. Weischwieweizen is a Swissgerman expression and means something like “You know what wheat”. I tweaked the recipe a bit and came up with the following recipe. 07/03/10: Another brew day begins. I crushed all the grains and mashed in at 48°C (118°F) except for the acidified malt. The first rest at 45°C is called a Ferulasäure rest (ferulic acid) and typical for wheat beers to get the typical clove aroma later on. I already covered the basics about this rest in a previous post of mine but include the information once again: Ferulasäure, in English ferulic acid, is the precursor for 4-vinyl guaiacol which has a clove aromatic aroma. The conversion from ferulic acid to 4-vinyl guaiacol is then made by the yeast cells during fermentation. One way to improve the clove aroma of a wheat beer is to include a Ferulasäure rest to increase the amount of ferulic acid in the wort. And this rest is done at 45°C (113°F). Another important thing for the Ferulasäure rest is the mash pH. The release of the ferulic acid from the grains decreases at lower pH values. To prevent a lower pH level for this rest, the acidified malt is therefore added after the Ferulasäure rest. The next rest at 53°C (137°F) is a protein rest to improve the head formation. Although modern malts do not need a protein rest anymore, I chose to do one because of the tradition. The rests at 63°C (145°F) and 73°C (163°F) are both saccharification rest. Iodine test was negative after the last rest at 73°C and I proceeded with the sparging process. I had some troubles with a stuck mash but managed to collect the wort in the end. Then boiled the wort for 75 min with the addition of the Hallertauer hops. After cooling the wort down to pitching temperature (20°C, 68°F), I split the wort in half and pitched a package of Wyeast’s #3068 Weihenstephan in one fermenter and #3056 Bavarian Wheat Blend in the other fermenter. 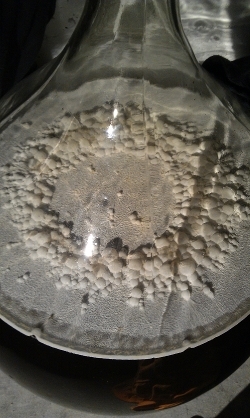 07/09/10: Six days after pitching, the yeasts already hit the terminal gravity. The #3068 Weihenstephan finished at 3.5°P, the #3056 Bavarian Blend at 4.2°P. I bottled the beers with an addition of fresh wort to a carbonation level of 3 vol. I then left the bottles carbonate for seven days at approximately 20°C (68°F) and left them for three weeks in my refrigerator at 4°C (39°F). Tasting: Unfortunately, I can’t remember when I did the tasting. Nevertheless, below are the tasting results of the two beers. They looked very similar as shown in the picture on the left. Lets dive into the results. Aroma: Lots of banana, light sweet note. Could be from the Pilsner malt. Some floral notes (geranium). Flavor: Once again, lots of banana and a malty-sweet flavor. No bitterness or hoppy notes detectable. Mouthfeel: Light to medium body, lively carbonation, short and sweet aftertaste. Very, very refreshing. Overall Impression: Amazing! Tastes like a typical wheat beer. I would not make any changes in the recipe. Aroma: Strong sweet and fruity aroma. Could detect some strawberry and banana notes. No floral notes. Appearance: Dull (poured yeast sediment into the glass as well), very persistent white head, orange to yellow color and a lot of bubbles. Flavor: Fruity notes (strawberry), no banana. No bitterness or hoppy notes detectable. Mouthfeel: Light to medium body, lively carbonation, short and malty-sweet aftertaste. Very refreshing as well. Overall Impression: Again a very well made wheat beer. I prefer the #3068 Weihenstephan version because I do not really like the strawberry notes in the beer. This recipe works very well for me. I brewed this recipe at least four times and it turned out very well each time. For further wheat yeast tastings, see the wheat beer experiment. Stay tuned for further recipes, experiments and tastings. Eureka, its time for another post. 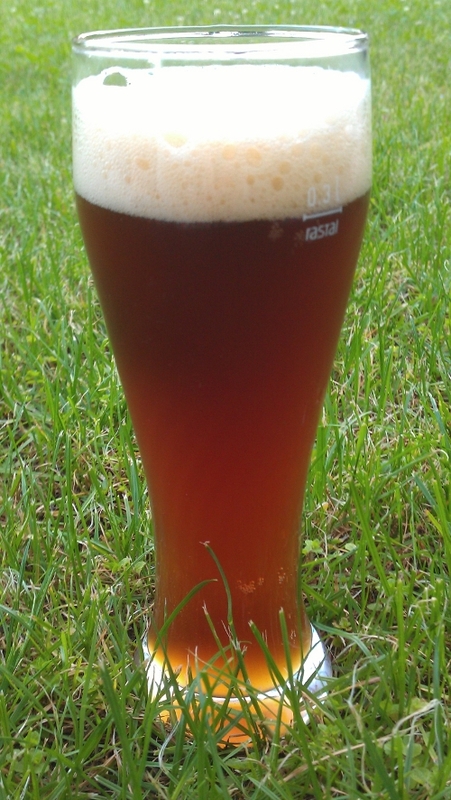 Todays beer we are looking at is the #48 Dunkler Nachthimmel brewed back in March 2012. Designed as a Dunkelweizen (dark wheat beer) and fermented in an open fermenter. Aroma: A lot of banana notes and some grain notes as well. Not bad. However, not a very fresh aroma. There were some other aromas in there I could not put in words. Appearance: Brown color, poured the yeast into the glass as well, creamy head. a lot of carbonation visible. Looks like a very typical wheat beer. Flavor: Could detect some banana notes, very overpowering solvent character… and the typical cardboard taste you get in an oxidized beer. Mouthfeel: Medium body, average carbonation level, short malty aftertaste. No bitterness in the aftertaste. Overall Impression: There is something wrong with this particular brew. I brewed this recipe before and went with a typical closed fermenter. The beer turned out very well back then. Another batch of this particular batch will be brewed tomorrow with freshly harvested 3068 Weihenstephan yeast and a closed fermenter. No experiments this time with open fermentations. I will repeat this open fermentation experiment for sure. However, further plating experiments are in progress. I finally ordered the supplies to try other media and indicators. Stay tuned! Eureka, its time for another experiment. But not about yeast this time… Sorry! The following experiment is all about hops and their role during dry hopping and bitterness. All started with a batch of Pale Ale where I tried the first wort hopping technique and added some hops for dry hopping (100 g of 14% AA Simcoe to 22 L (5.8 gal)). And the tasting revealed an overpowering bitterness. And some really grassy notes as well. This made me wonder how the bitterness could increase to such a high level in the first place. And there are two possible explanations in my opinion: The first wort hopping technique or the dry hopping. And this experiment was to find out, if the dry hopping can increase the bitterness in some way. Some say that the bitterness only increases when the hops are boiled and the alpha acids isomerize. Others say that the bitterness can increase as well if the hops are not boiled. Lets find out how is right. What I did was the following: I took a Vodka and diluted it down to have 400 mL of a 5% alcohol solution. I did so to have the same amount of alcohol like you would have it in an average beer. Using pure Vodka could lead to false conclusions since the higher alcohol content could extract different/less/more compounds from the hops. I then added 100 mL of the diluted Vodka to a bottle each and added some Simcoe hops to have the following hops to volume ratio: 4 g L-1, 8 g L-1, 16 g L-1 and 32 g L-1. Common rates for dry hopping are in the range of 3.9- to 7.8 g L-1 (according to Calagione Sam mentioned in “Extreme brewing”). 03/02/12: Added 14% alpha acid Simcoe hops to the four bottles according to the mass to volume ratios mentioned above. I stored the bottles at room temperature at a dark place for nearly three weeks before a tasting. 03/22/12: The tasting begun. I first start with the color differences of the liquids. It could be easily observed that a higher amount of hops lead to a darker, more orange pronounced color (Fig 1). Unfortunately, there is a light difference between the two bottles shown in Fig 1 (brighter on the left side). Nevertheless, there was a difference. 4 g L-1: At the lower end of the dry hopping rates. Alcohol was easy detectable, very faint hop aroma. Maybe some hints of oranges. And the taste was just bitter. Not overpowering, but bitter. 8 g L-1: At the higher end of dry hopping rates. More intense hop aroma than the previous one. Very grassy. And the taste was just horrible. Just like eating a hop pellet. And it was definitely more bitter than the previous one as well. 16 g L-1: Extreme hoping rate 1. Orange notes in the aroma. Floral notes as well. This one is my favorite of the four concerning the aroma. And the bitterness was comparable with the one before. 32 g L-1: Extreme hoping rate 2. Floral notes, very aromatic hop aroma. The aroma is too intense for my taste. And again, the bitterness is very similar to the one before. To conclude, the intensity of the aroma increases with the amount of the hops you add for dry hopping. I guess this is no surprise. What I am a bit more surprised is the fact, that the bitterness increases with the amount of hops as well. But only to a level of 8 g per liter of liquid. Further addition of hops does not increase the bitterness. Or at least not in a way that I could taste it. I have to mention here that I am talking about perceived bitterness not IBUs. I have no idea about the IBUs of the four samples. Lets assume the IBUs of the different beers are the same if we consider that the IBUs originate from isomerized hops. Lets further assume that no isomerization happened during the experiment. How could we explain the increase in bitterness now? One possibility could be the extraction of compounds from the hops by the alcohol present. This would imply that further compound(s) in the hops can increase the bittering sensation. And basically lead to the conclusion that a higher amount of dry hops can increase the bitterness. Not the IBUs but the perceived bitterness. I assumed that hops for dry hopping could maybe just add a bit of bitterness. But here we are talking about huge impacts. The liquids with the highest amounts of hops tasted like liquid hop pellets… I am still not really convinced here. Maybe this is just something happening only in the used Vodka-based liquids. It is therefore advisable to replicate these results using a fermented barley-based liquid. However, I conclude that a higher amount of hops in a Vodka-based liquid leads to an increasing perceived bitterness (can’t tell if the IBUs increased). Please let me know if anyone out there has an idea what happened here or if you obtained different/same results as well. Cheers and stay tuned for further post.